Acco Presstex Grip Punchless binders provide a durable and professional option for binding your important reports and documents without the need to punch any holes in the paper. Often used for thesis documents and reports that need to be quickly unbound, Acco Presstex Grip Binders are made from an acrylic-coated pressboard that offers excellent moisture-resistance. 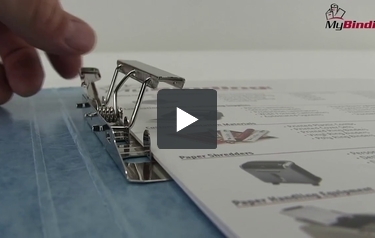 The side position spring-action clamp holds paper securely allowing the binder to be used with unpunched sheets. These folders are great for storing papers neatly without making holes in the papers. I use them for magazine pages of recipes as well as for legal papers. I do feel the price is unreasonable. I would buy a lot of them if the the price came down some. The newer construction is somewhat chintzy. The older binders in our office have held up much better. What is the difference between Wilson Jones and Acco prestex grip punchless binders? Thank you for your question. The only real difference is the name printed on the box. Wilson Jones is a sub brand of Acco. I'm looking for the Presstex Grip Punchless Binder in legal size, 14 x 8.5". Do you carry that product or can you tell me where I can purchase it? Thank you for your question. You can find our selection of legal sized Presstex binders here .